Rob Lister wrote: I don't what to keep beating this dead IPV4 horse, but this horse ain't dead yet. I heard there is over a thousand year supply under Jerusalem. . . . So ARS decided to update me on this. A very nice 2-page read. Why web developers find it necessary to segment an internet article into pages, I do not know. Perhaps someone here will pontificate on the matter. Of course in order for packets to be routed across the internet, a computer or other networked device first needs to be configured with an IPv6 address. It would be nice if an IP address could be burned into a device at the factory the same way an Ethernet/Wi-Fi MAC address is put in a device at the factory. But our poor routers have a hard enough time keeping track of all the IPv4 addresses in the form of half a million large blocks—they wouldn't be able to keep track of billions of individual IP addresses. This is similar to how each city has its own area code so the phone companies don't (well, didn't) have to know where each individual phone number goes. Of course this means you need to get a new number when you move to a new city. Same with IP addresses: you need to get a new one when you move to a different (sub-)network. That used to be true but isn't always true anymore. My brother in law currently lives just down the street and he has the same number he used in Los Vegas. I don't know what area code that is without looking but it isn't the local 757. NSA would like to know what machine is used by whom. Simple. ed wrote: NSA would like to know what machine is used by whom. Simple. I'm not sure how that would be easier/harder than what we have now. As it currently stands, I don't have a lot of control over what my IP addy is. My ISP decides. I can [sometimes] get a new one by rebooting my modem but it isn't up to them. If the NSA (or anyone else) wants to track down an IP addy used for any particular purpose on any given day, they need only (or only) contact my ISP (or VPN provider) and ask, "Who is connected to X.X.X.X at time zz:zz?" Nothing there changes with IPV6 except now they have to ask, "Who was connected to X.X.X.X.X.X.X.X.X.X.X.X.X.X.X.X at time zz:zz?" And yet the internet hasn't collapsed. Abdul Alhazred wrote: And yet the internet hasn't collapsed. Companies use maybe a few IP V4's outside, and go with Network Address Translation internally? Skeeve wrote: Companies use maybe a few IP V4's outside, and go with Network Address Translation internally? I don't know how mobile differs from non-mobile and why they find the transition easier or more expedient. 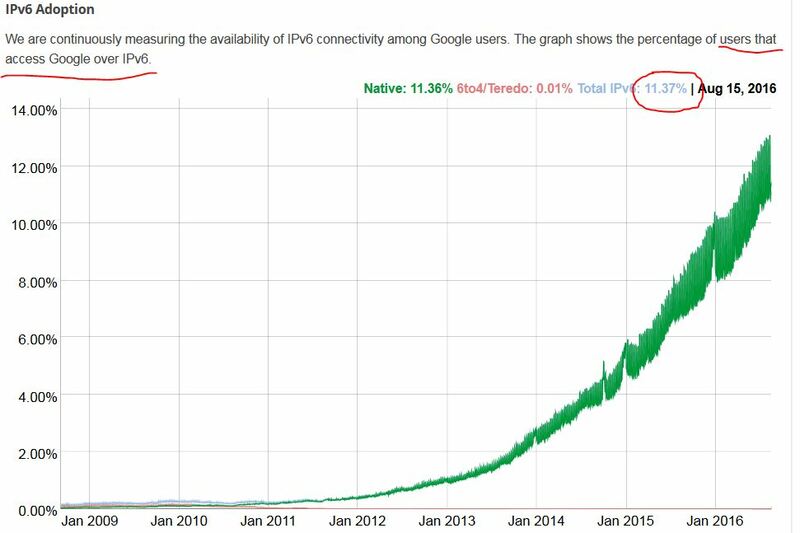 Google tells me that 11% of folks hitting them are ipv6. Which in turn tells me that mobile users do not use google nearly as often as stationary users. Mr. Lister wrote: Why web developers find it necessary to segment an internet article into pages, I do not know. Perhaps someone here will pontificate on the matter. 4) tells the publisher which writers are being read through to the end. That sounds right to me. But not everybody does it. Seems like more of a thing that the crappier websites do. With a slideshow for example, images contain a lot of bytes so it makes sense to show them to you one at a time instead of all on one page. Some websites these days will hide the lower part of the article and you have to click a button to unhide it. If you only want to read the first paragraph or so you can do it without clicking the button. I wonder if they know how far you scroll down? If an ad can only be seen by scrolling down, can they tell if it's been seen? Delivery is the most trivial cost in the overall production. I believe it would cost many times more to pay the web developer to create the slide show then just pushing all the photos at once. But even if not, HTML5 knows when you scroll and can push content as you scroll down. Oh, yeah. I've noticed that on a lot of new websites if you keep scrolling down they will just show you another article, and another after that and so on. I think the URL in your search bar might even change. Wrong synopsis. Meh, fits better.